DEC is in the business of establishing hunting seasons for swans and other birds, and it’s taking a stab at that by maligning them as a non-native species. True, they are exotics, but they are not invasive. House sparrows, pigeons, ring-necked pheasants and starlings are immigrants, too, all of whom cluster in and around New York in numbers far greater than those of mute swans. The truth is “business” is down for the DEC, and the agency is desperate. New York is no longer one of the nation’s top five hunting states. Numbers of hunters nationwide have fallen to 5 percent, yet in New York, hunters number only 2.8 percent of residents – and the majority of those shooters live upstate. The public comment period will close on December 6, 2017. Mute swans harm no one. They contribute beauty and grace to our parks lakes and other waterways, bringing joy to wildlife watchers wherever they are. 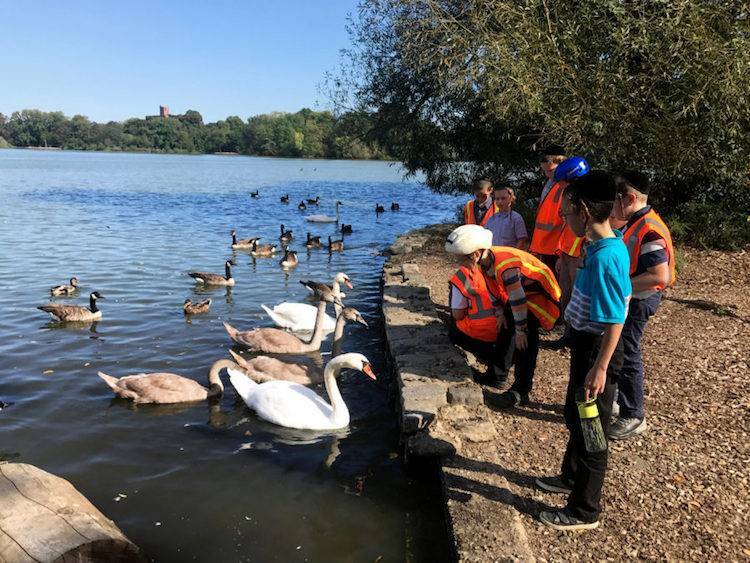 It isn’t surprising, however, that New York’s Department of Environmental Conservation (DEC) is back with a vengeance trying to demonstrate that mute swans damage the environment or other species, despite Gov. Andrew Cuomo’s support of the passage of legislation last November, which Friends of Animals provided input on, that put a 2-year moratorium on any management plan and requires the agency to provide scientific evidence. Despite the fact that the legislation requires the agency to provide scientific evidence of damage, hunter-bureaucrats are back with attitude– minus good science– calling for a control scheme. That’s why FoA testified on October 18 at a public hearing in in New Paltz, N.Y., to sound off about it the newest version of the same misguided plan. New York’s 1,700 mute swans constitute less than one-quarter of one percent of the 502,336 waterfowl counted in the state in 2016. Ducks, geese and other swans also consume aquatic vegetation. Why, then does the DEC want to hammer these snow-white, long-necked, attractive birds that that so many wildlife-watchers enjoy seeing? DEC’s original 2013 plan called for eradicating all mute swans, but the agency faced intense backlash against the plan. Its revised plan seeks to “control,” not eliminate swans, yet its undermining drum beat remains—accusing swans of damaging the environment, and being too aggressive to anglers, boaters and other birds. DEC proposes reducing their growth through molesting 100 nests downstate and killing 100 swans a year upstate to supposedly make more room for other waterfowl craved by hunters. DEC treats hunters like clients and in its plan says it will evaluate public attitudes about hunting. Clearly their brand of mute swan education hopes to turn swan-watchers into haters. Overall, DEC’s efforts to hunt, control or eradicate mute swans are not new. In 1992, DEC adopted a Draconian policy declaring them undesirable, too numerous, and gluttonous— tearing up and gulping down copious pounds of submerged aquatic vegetation. The DEC always fails to talk about how the loss of aquatic vegetation has to do with runoff containing significant concentrations of nitrogen and phosphorus from fertilizers, pesticides, and industrial and animal waste. It’s not up to mute swans to improve and upgrade sewage treatment plants that are overwhelmed by storm runoff. We must curb pollution of waterways rather than scapegoating swans. Of 19.75 million New York residents, 8.55 million live in New York City and most swans reside downstate. There are 44,800 migratory bird hunters in New York, which means only .23% of resident hunters are inclined to shoot birds to death.